Fifth Edition Boxed Set Incoming! With the Rulebook for Warhammer 40,000 Fifth Edition arriving in July, Games Workshop has released first official word of the companion starter V5 Boxed Set, to follow in September. 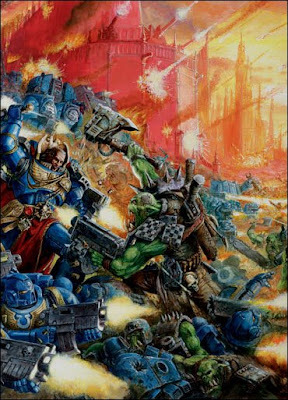 The new starter box will reflect many of the 'back-to-its-origins' qualities evident in Fifth Edition rules, by pitting the antagonists available in the very first Warhammer 40K 'big box' version of the game, the 1992 Second Edition, as the iconic Space Marines battle the Orks. 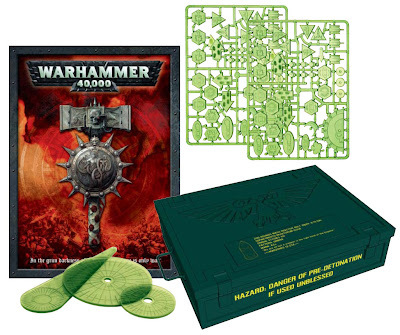 The contents of this edition will put all previous 40K boxes to shame, however, with its model count--and *every* model in the box will be a newly-tooled, 'click-together' style version, designed to increase ease of assembly for players new to the game and the hobby, yet be indistinguishable once put together and fielded on a tabletop from the multi-part models available in add-on squad boxes. Ork players, already revelling in one of the best-received new codices in years, will get a new Ork Warboss, five new Ork Nobs, a unit of Ork Boyz and three new plastic Deth Koptas; Space Marine players will counter with a new Space Marine Commander figure, five elite Space Marine Terminators, the essential Tactical Squad, and an iconic Dreadnought! Each will include additional bonus models (including new playable terrain pieces), dice, templates and all of the V5 essentials, as well. The rulebook which will come with this starter box will be a condensed form of the stand-alone hardcover rulebook, available in July. It is described as abridged, but fully-playable in conjunction with a given Army Codex. This frankly-spectacular box of forty-first millennium goodness will be available from your local stockist in September 2008, with an anticipated on-the-shelf retail price of US$60...a price which makes the contents look even more spectacular. Two nearly-500-point starter armies and all the essentials for about sixty bucks: the fall looks to belong to the grim darkness of the far future. Place your order for one of the first batch of V5 Boxed Sets from your favorite Stockist. The grim darkness of the far future...is closer than you think. 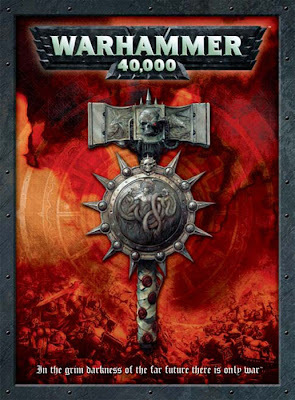 Warhammer 40,000 will see a new edition--the fifth rules set for Games Workshop's popular gothic science fiction miniatures wargame--in July, 2008, with the release of the updated rulebook in hardcover. This edition will be back-compatible with in-print army codex books and existing miniatures, to insure a smooth transition for hobbyists. In addition to the hardcover rulebook, which will be a regularly stocked item, GW will make the V5 rules available in two special editions, available *only* at the time of the new game's release. 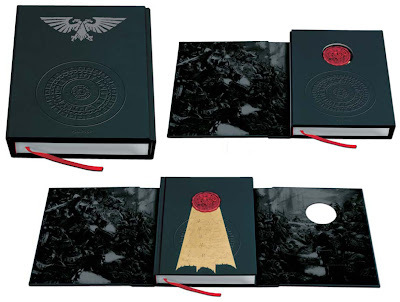 The Collector's Edition will feature a multi-fold slipcase, a genuine purity-seal embossed cover, and will be printed in strictly-limited numbers worldwide. The Gamer's Edition will be a package including the regular hardcover rulebook along with special edition templates and an advance release of the new movement and action markers, all in a special 'ammunition crate' with foam inserts, which can subsequently be used for figure storage or transport, etc. 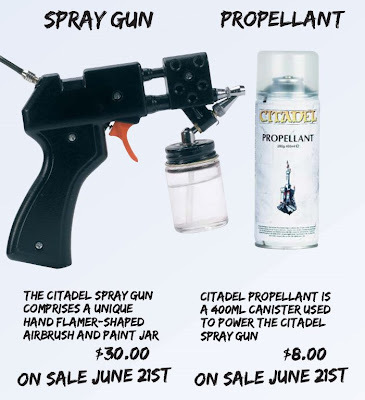 Hobbyists interested in these special editions should pre-order from their regular stockists; as with similar special edition releases in past, they will be available in only limited numbers and when gone will not be re-released.